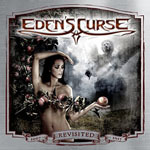 Share the post "Album review: EDEN’S CURSE – Eden’s Curse (Revisited)"
Is it really 10 years? Phew! The timeline of EC has pretty much followed that of GRTR! and we have been enthusiastic supporters throughout. But a revisiting of the debut album in 2007? Well I suppose it is an excuse for a tour “concept” and a stop-gap between the new stuff. Does it demand a remake? Well the Curse line-up has changed a few times in a decade and perhaps they wished to further erase the memory of original singer Michael Eden. Although a name change would have more properly taken care of that. The band now have a new-ish vocalist on board – Nikola Mijic – along with a new-ish drummer John Clelland and keyboard player Chrism. I can see the merits of a re-hash but on reflection perhaps the debut should have been left as-is. I mean it wasn’t that bad when it was released and Eden a half-decent vocalist. Production values haven’t really changed much either with melodic metalmeister Dennis Ward in from the start. In truth, the re-recording lacks his fairy dust. Although, if the remake allows redoubtable guitarist Thorsten Koehne to do more widdle, mission accomplished. Eden’s Curse are a good example of a band who have emerged from the Internet, hung in there for a decade, always producing quality product whether it’s the music or the merch and under the careful stewardship of bass player and chief songwriter Paul Logue. But, like many quality bands of the era, they have failed to gain a wider foothold. This might have more to do with budgets, buy-ons, and harder economic times. Or simply the “competition” in their chosen melodic metal genre. There’s simply too much out there. EC have frequently straddled – perhaps confusingly for the uninitiated – power metal, prog metal and heavy metal genres. And, whenever I have seen the band live the sound has been dreadful, another reflection of the times and usually a symptom of too many support slots in low ceiling dives. This new recording comes with a bonus DVD of a Glasgow show from 2014 which should please their fans. This entry was posted in ALBUM REVIEWS, ALBUM REVIEWS (Mobile), All Posts and tagged album, Eden's Curse, hard rock, heavy metal, melodic, metal, Paul Logue, re-recording, review, Revisited. Bookmark the permalink.